Our everyday grilled chicken got a makeover with a quick marinade and a little feta and herbs. Add some sliced cucumbers and peppers on the side, and this is a full, healthy, meal. In a large Ziploc bag, combine lemon juice, red wine vinegar, olive oil, garlic, and oregano. Salt and pepper chicken, and add to marinade. Refrigerate the chicken for 30 minutes to 2 hours. Heat the grill to high heat and grill the chicken for 4-5 minutes, discarding marinade, then flip it over and grill for another 4-5 minutes or until the chicken is cooked through. Whisk together all the ingredients and refrigerate until ready to serve. 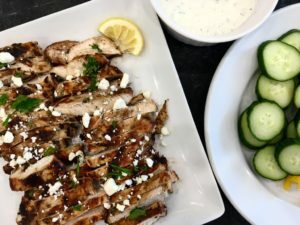 Copyright © 2016 Our Everyday Dinners - This is an easy recipe for how to make Greek Lemon Chicken with Tzatziki Sauce.